THIS ADVENTUROUS COUPLE RANG IN THEIR 30TH BIRTHDAY BY ELOPING TO VEGAS! This was one birthday celebration that was about to spiral out of control! “We decided it was all or nothing. Tell everyone or tell no one, as how was it fair to tell one person when I wasn’t even telling my own mother. So we kept quiet! I think if one seed of doubt was planted in my mind by anyone, I wouldn’t have been able to do it or it would have put a massive shadow over our big day! We researched online and found The Wedding Travel Company a fantastic business who organized everything, so minus one year to the big day we booked it! Vegas, Hawaii and LA – a wedding, a honeymoon, a holiday of a lifetime we would never ever forget. Now the hard part keeping schtum for a whole year! Now to the fun part, the planning!!! 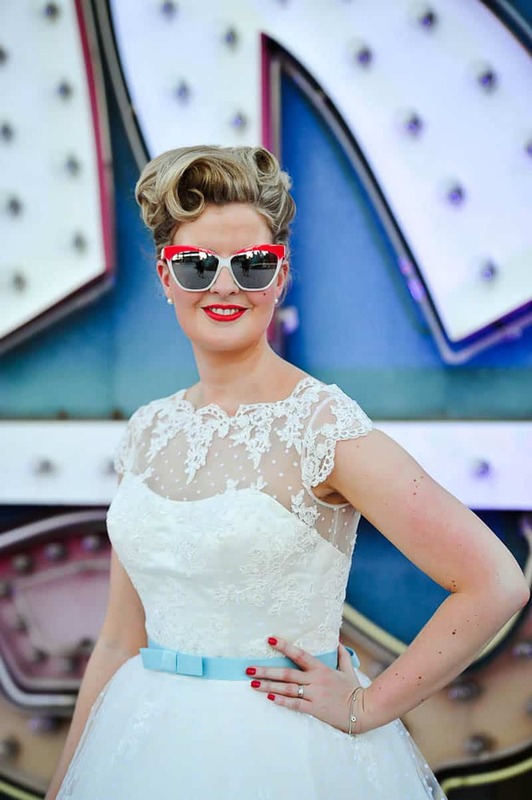 Next the photography, I was googling like a madwoman and I had seen many pictures of Vegas weddings in this cool vintage looking scrap yard, which I soon discovered to be the Neon Museum, so I immediately enquired! Now the photographer I noticed some stunning pictures that kept on cropping up in my searches, they belonged to Jamie Yacksyzn. She was perfect and I knew she could capture our very special elopement wedding. As these pictures had to tell a story to show our family and friends back home. August 2014 was here and the big day was finally upon us! Not only was this Greg’s Grandparents wedding date but it was soon to be ours. We’d arrived in Vegas on Sunday and did the whole tourist thing for a few days. Greg surprised me and got down on one knee the morning of our trip to the Grand Canyon and officially popped the question! So my perfect diamond ring was in its rightful place. Now everything was complete. The day started off with a bang, with a champagne breakfast at The Wynn, I then returned to our hotel room alone and sat on the bed, nervously awaiting a knock on the door. The first knock was hair and makeup! Jamie my photographer was extremely helpful as of course being from UK, I did not have the foggiest of how to arrange or who was actually good…..well Your Beauty Call was fantastic! I did not recognise myself! My hair was incredible and my makeup was perfection, I’d never dreamed I could look like that! The second knock was Jamie and we finally met, she made me feel very relaxed and even helped me to get into my dress! She took some very beautiful shots of me getting ready and then we said our goodbyes for the time being – as the Wedding Chapel doesn’t allow outside photographers. The third and most nerve racking knock came, it was Greg about to see me for the first time as his bride to be! Happily I can say the look on his face is one I will never forget, a very special moment for me. We walked through the hotel lobby, with many looks and polite cries out of “congratulations” to meet our chauffeur. He was ready and waiting to take us on our wedding adventure! Everything went so smoothly, from getting our wedding license at the courthouse, to arriving at the chapel on time, to the intimate ceremony – We were definitely on cloud 9. We then floated to the Neon Museum, Jamie was waiting for us poised and ready to start snapping again as the sunset. With the light fading we now moved on to Freemont Street to capture the neon at its best and it certainly was, again breath-taking photos. We were on top of the world! And we certainly ended it that way with a well-deserved Wedding dinner at the Stratosphere with a toast to the bride and groom! We did it!